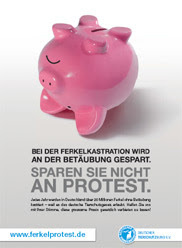 Blog of Swine: Current call for action: Ferkelprotest! Something I will feature from time to time on this blog is a link to a current pig rights-related action. The first one is the German Tierschutzbund e.V. action against the castration of male piglets without anaesthesia. This obviously subjects the little pigs to terrible pain. 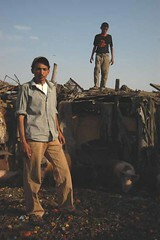 Every year, over 20 million male piglets are castrated without anaesthesia. But together we can fight to change German law, so that castration without anaesthesia will be outlawed! On the website ferkelprotest.de you can add your signature to protest against this cruel practise. Are you not German? Find out whether castration without anaesthesia is also practised in your country. If it is, protest against it! Contact your local animal rights NGOs and fight together.